In the 1950s, Edinburgh transitioned from a multimodal public transit system based on buses and electric trams to a system based solely on the former. 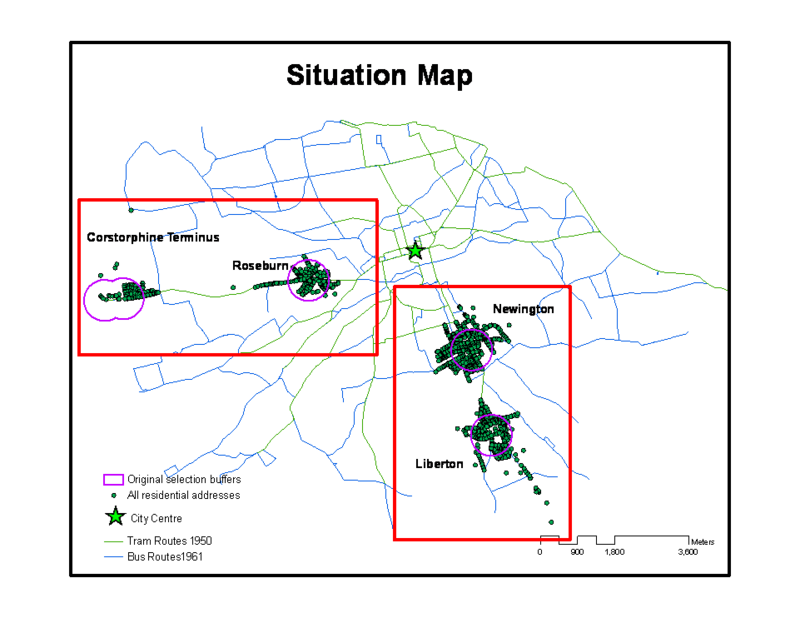 Identifying two pairs of neighbourhoods with comparable initial transit and socioeconomic states, known divergences in transit modality and measurable end states, this study sought to illuminate local variations using a two-pronged methodology, a syncretic approach which allowed each line of inquiry to strengthen the other. While the use of intersections, GRID analysis and self organising maps for visualisation were largely successful, the use of robust statistical methods for formal hypothesis testing proved problematic. Statistics were ultimately used in an exploratory manner alongside the other techniques to elucidate the city's relationship with public transit in general and with the trams in particular. Considering rent as a measure of locational desirability in comparison with alterations in accessibility, how were Edinburgh's neighbourhoods impacted by the replacement of trams by buses? While certain patterns of socioeconomic and accessibility variables were found to coincide, no effect of the modal change could be definitively perceived within the studied time frame. Situation map showing address points for the four neighbourhoods and tram and bus networks at their greatest extent (1950 and 1961 respectively, bus routes coincide with overlying tram routes). City centre is on Princes Street midway between most heavily trafficked fare stages. Purple selection buffers centre on chosen fare stages. Red boxes indicate zoomed in areas on isochrone maps. The method of hedonic pricing, whereby the desirability of a location due to any number of factors can be intuited from its rent, was used for this dissertation. Accessibility was the main factor under consideration, however previous studies have shown that other socioeconomic factors can obscure or deform these patterns. Historic socioeconomic address-based data were collected and geocoded for 1950 and 1960 for four selected neighbourhoods: Corstorphine and Liberton were at the ends of the tram lines at their maximum extent, while Newington and Roseburn were Victorian 'streetcar suburbs' closer to the city centre; the tram line running through Roseburn and Corstorphine was removed some years before that running through Newington and Liberton. Period- and mode- specific networks were built for 1950, 1956 and 1961, and isochrones and catchments were created. 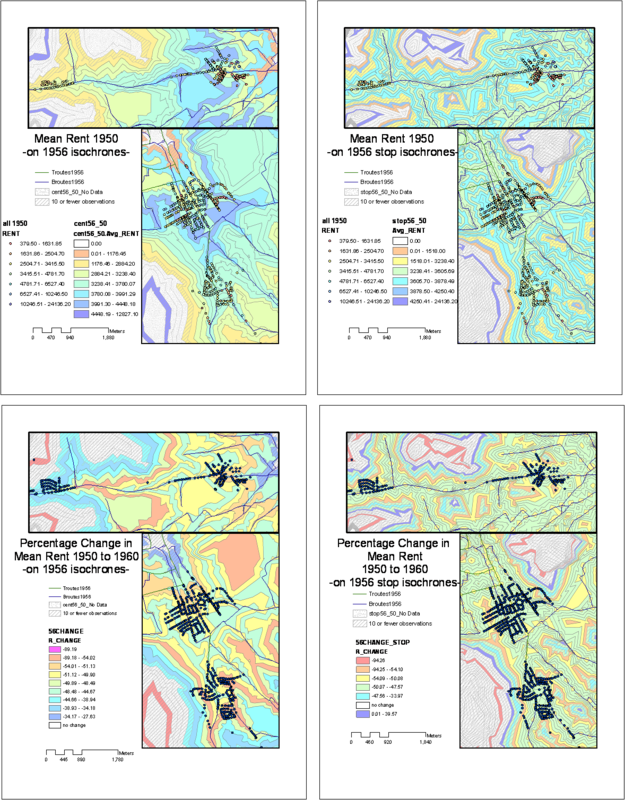 These two sets of shapefiles were spatially joined with each other to produce attributed polygons for visualisation and tabular point-based data for self organising maps and statistical analysis. Visualisation was also performed using rasterized versions of the isochrones. 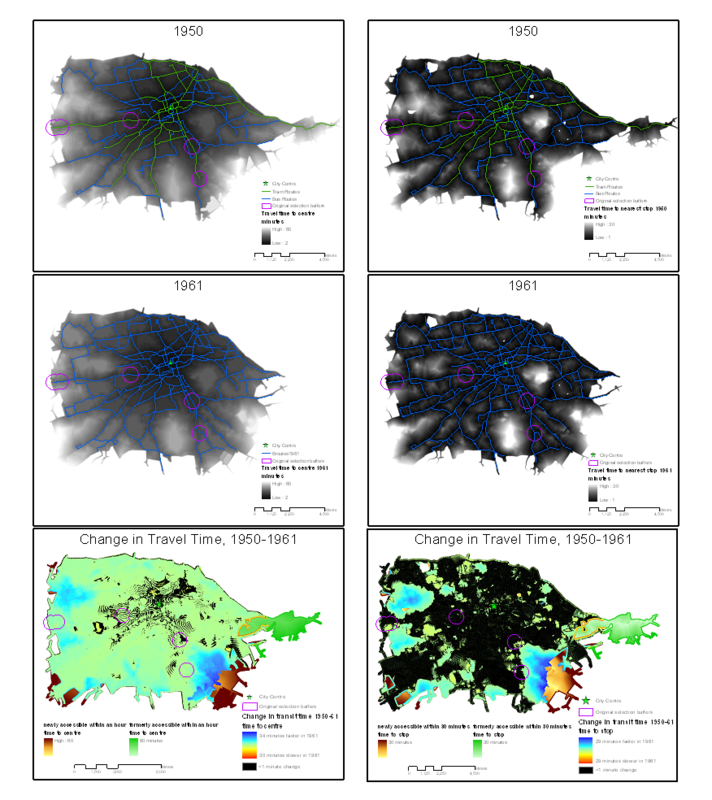 Travel time to city centre via the multimodal network (left) and to nearest public transit stop (right), in 1950 (top) and 1961 (centre), and the change in these accessbility measures over the decade (bottom). Mean rent in 1950 (top) and change in rent from 1950-1960 (bottom), aggregated to time-to-centre (left) and time to nearest stop (right) isochrones. Rent generally shown to decrease as all rents from 1950 and 1960 standardized by average earnings (a measure of affordability relative to contemporary wages). Self organising map of tram and bus related variables and ranked 1960 rent showing how little the former clusters with the latter. (centT50- time to centre via 1950 tram network, toTstop50- time to nearest tram stop in 1950, tr50.5min- number of tram routes accessible within a 5 minute walk in 1950, etc; Y_RANK-ranked rent; C-Corstorphine, L-Liberton, N-Newington, R-Roseburn). From the data presented here, it is concluded that the transition from a multimodal to a unimodal system did not greatly alter time-based accessibility for most of the city and while socioeconomic factors did change, the cause of their alternation cannot be easily ascribed to the change in transit. There are several factors which may have confused this conclusion. Transit patterns in Liberton and Corstorphine were confounded by these neighbourhoods' expansion over the course of the decade, the construction of council housing in the former and the unusual spatial distribution of the latter. While Newington and Roseburn changed little, the density of their local transit networks and the variability of their socioeconomic characteristics made it hard to tease out the effects in question. Accessibility cannot really be considered poor for any location at any time: variation may have been too small to have a measurable effect. Edinburgh's transit system was little altered for decades and modal transition was sudden: if there was a lag time it may have extended beyond the temporal range of this study. Rent may not have been a good measure of attractiveness owing to government rent controls and housing specifications built into feuing contracts. Confusion of results also arose from methodological choices. The selected pairs of neighbourhoods proved not as comparable as their positions on the original tram line would suggest, while comparison with working class neighbourhoods or neighbourhoods not on original tram lines may have been more instructive. The results suggested that citywide maps and statistics obscured important local patterns, but the use of spatially- defined neighbourhoods themselves as a framework may have been detrimental and misleading. Intra-neighbourhood variance suggested these units were hardly homogeneous. Likewise, while aggregation to ward polygons was avoided, forcing address data into the polygonal representation of isochrones- and the implicit assumption that effective distance would sufficiently account for spatial effects- partially negated the benefits of point-based representation. Edinburgh Corporation Transport Department, 1956. Edinburgh Corporation Transport Department annual report, 1955-1956. Edinburgh: Edinburgh Corporation Transport Department. Edinburgh Corporation Transport Department,1951. Edinburgh Corporation Transport Department annual report, 1950-1951. Edinburgh: Edinburgh Corporation Transport Department. John Bartholomew and Son, Ltd., 1961. Edinburgh Corporation Transport (Bus routes and city centre plan). (no series or sheet number given), 1:18,624. Edinburgh: J. Bartholomew & Son. John Bartholomew and Son, Ltd.,1956. City and Royal Burgh of Edinburgh Transport Department. (Edinburgh Transport Map). (no series or sheet number given), 1:18,624. Edinburgh: J. Bartholomew & Son. John Bartholomew and Son, Ltd.,1950b. Edinburgh transport map: tram, bus, coach routes. (no series or sheet number given), 1:18,624, Edinburgh : City of Edinburgh Transport Department. Ordnance Survey, 2010. OS MasterMap Integrated Transport Network (ITN). [gz file]. Ordnance Survey. Available at: www.edina.ac.uk [Accessed: 14 April 2010]. Ordnance Survey, 2010. OS MasterMap Topography Layer. [gz file]. Ordnance Survey. Available at: www.edina.ac.uk. [Accessed: 26 April 2010]. City of Edinburgh, 1961. Valuation Roll for the City of Edinburgh 1960-1961, Parish of the City of Edinburgh. Edinburgh: City of Edinburgh. City of Edinburgh,1951. Valuation Roll for the City of Edinburgh 1950-1951, Parish of the City of Edinburgh. Edinburgh: City of Edinburgh. Thanks to: Dr. W.A. Mackaness and Dr. J. Wood; Dr. A.D. Ochojna, Dr. C. Fleet, S. Nicol, Dr. R. Hodgart, and Dr. V. Tanasescu; J.A.S. Clifford and L. Walls; the staffs of the National Library of Scotland Map Division, the Edinburgh City Library, the Edinburgh City Archives and the National Archives of Scotland; and Harper-Collins Publishers.